Cluff Mechanical Heating & Air Conditioning offers complete residential and commercial air conditioning system repair in Phoenix, AZ and the West Valley. Arizona summers are extremely tough on our A/C Units, which is why it is so important to make sure your air conditioner is running efficiently year round. To keep it running properly, call our certified technicians to check and maintain your unit every summer and winter. By extending the performance of your system, you will save hundreds every year on your energy bill. Below are just a few things we check every summer to make sure you’re not left out in the heat! Check and clean the indoor coils of your unit. Dirty coils can damage your A/C unit over time and raise your energy bill by having to work harder. 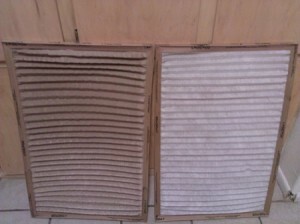 Dirty coils also causes dirty air to circulate in your house causing air quality problems. Another cause of higher energy bills and system wear and tear are dirty condenser coils. When dirty, they prevent the transfer of heat to keep your unit running smoothly. In addition to poor performance, these can lead to expensive repairs. We inspect all electrical components for system performance and the safety of your home. Without regular maintenance electrical components can meltdown due to high resistance. Last but not least, we will make sure you are up to date on the most basic task to keeping a healthy A/C system, your air filters. Are you replacing them every 30 days? Dirty air filters cause your system to work harder. The heat is in Arizona so contact Cluff Mechanical today for immediate A/C service and repair. Our experience and expertise is second to none. We offer Residential and Commercial services across Central Phoenix, AZ and in Goodyear, AZ, Avondale, AZ, Litchfield Park, AZ, Buckeye, AZ, Tolleson, AZ, Laveen, AZ, Surprise, AZ, Glendale, AZ and Peoria, AZ.